That's right. River stones you can actually eat! Only at 2-Michelin star restaurant Mugaritz by Chef Andoni Luis Aduriz. The edible river stones are a classic molecular gastronomy dish in a category some call "culinary deception" or "culinary trompe l’oeil", French words for "deceive the eye", an art technique that uses realistic imagery to create the optical illusion that the depicted objects exist in three dimensions. 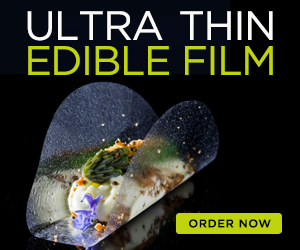 In modernist cuisine, chefs Andoni Luis Aduriz, Wylie Dufresne and René Redzepi use this technique to present the food in creative ways, surprise the diner, enhance the senses and bring out feelings and emotions to ultimately deliver a memorable and unique dinning experience. Some creative dishes in this category are foie hazelnuts, edible lipstick, cigar smoke ice cream, truffles of sauce grande, dried olive soil, edible charcoal, edible sand, raw egg, cauliflower couscous and watermelon steaks. Two of the stones below are edible. Can you tell which ones? 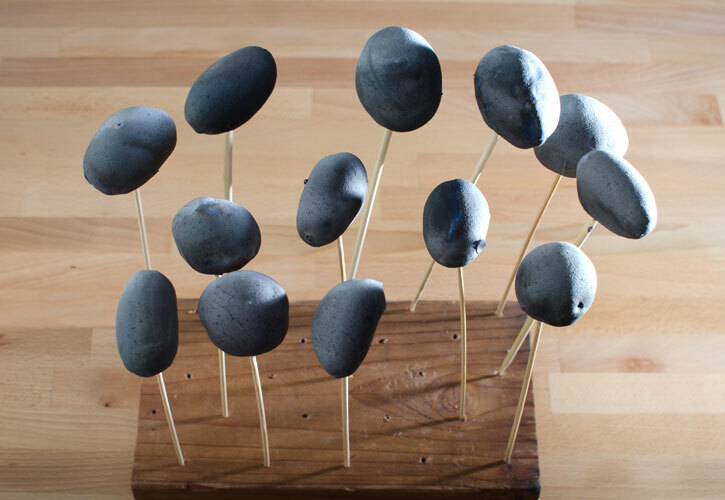 The Mugaritz team reveals a new culinary category that creates an object that retains the same sensory qualities of a potato, but with the outward aspect of a stone gathered from a river bed. This creation transcends the basic trompe l’ oeil exercise in illusion with a new idea of food coating. The coating does not merely transform the appearance of the product; but also retains the humidity of its content and adds crunchiness. This is one of the few cases of retaining a crunchy surface while hot, since it is rare in any traditional recipe that crunchiness and humidity could be compatible with such a texture. Mugaritz has become synonymous with R+D. Now ranked #6 on The World's 50 Best Restaurants List by Pellegrino, Mugaritz closes for four months a year, a window which is devoted almost exclusively to creativity. Before opening his own restaurant, Chef Aduriz worked at El Bulli and learned from the worlds's most renowned chef Ferran Adrià. This experience opened a world of possibilities to him. Mugaritz dispenses with traditional dining norms in its quest to deliver a complete sensory and creative experience. No menu, edible cutlery and centerpieces, and of course, edible river stones, are some of the ways in which Chef Aduriz delivers the stories, flavors, smells and textures that make up his idea of the perfect journey through food. In 2011, the Research and Development Kitchen of Mugaritz Restaurant was working on formulating edible coatings and pursued creating a visual replication of a product that is foreign to a given culture, the Andean tunta (see picture below). The tuntas were introduced by the population of the Andean highlands between 2000 and 3000 years ago as a means to conserve potatoes during periods of scarcity. The procedure consisted of first submerging the potatoes in flowing river water and then sun drying while allowing the potato to freeze. The result is a potato with a whitish surface and velvety texture that needs to be re-hydrated and cooked before consuming. These potatoes,which in their dried state, have such an evocative appearance, inspired in the Mugaritz team a desire to replicate them. As such, they posed a challenge of imitating one aesthetically exotic ingredient, while changing and molding the organoleptic qualities of another. That is to say that something apparently inorganic and of a semi-rigid texture, unexpectedly would, with a gentle bite, give way to a surprisingly creamy, sweet, and vegetable consistency. The Mugaritz R+D team took this idea further and played with the visual prejudices of the guest in order to introduce a new culinary element through the introduction of other ingredients in the form of a river stone. A river stone is a universal element in the common imagination of each guest. In that sense, it is not at all like a tunta, which is peculiar to a specific culture and geographic area. 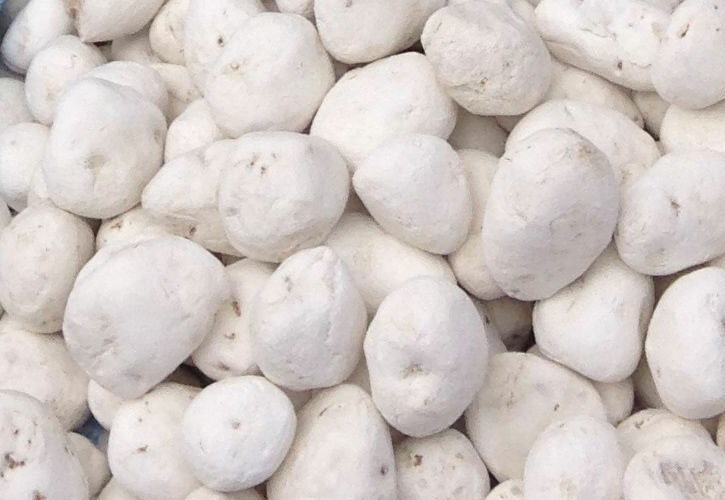 In effect, the goal was to find a culinary formulation and method to convert boiled potatoes—at first glance Andean tuntas—to edible replicas of river stones. In other words, to find a culinary formulation and method to endow a traditional food with the capacity to evoke something quite different. The first step was to carefully select the best potatoes for this application and they chose the cherie variety for its small size (32-35 g), uniformity, resistance of the skin, sweetness and creamy texture. For the coating to imitate the andean tunta, the team decided to work with lactose and agalita which are both white in color. For the next step of developing a formula for food pigments to imitate the river stones, the Mugaritz team tested dentie, black vegetable paste, granular corn meal, extra virgin olive oil, dark broth and natural squid ink. For applying the coating, the team tested two application methods: a brush and dipping the potatoes in the coating mix. Overall the team came up with 13 different formulations to test altering the proportions of kaolin, lactose, water, coloring agent and coating method. They documented and carefully evaluated the 13 resulting specimen on coating thickness, coating appearance, coating texture and overall taste to come up with the best edible river stone you can imagine! Once the potatoes are coated, you need to let them dry suspended in the air so you get a smooth surface all around. You can skip this step and let them dry on a flat surface but one side won't be smooth. They'll still look good on the plate but the diner will notice the imperfection when holding the edible stone in the hand. 1- Drill holes on the wood block, about 1.5 inch apart. 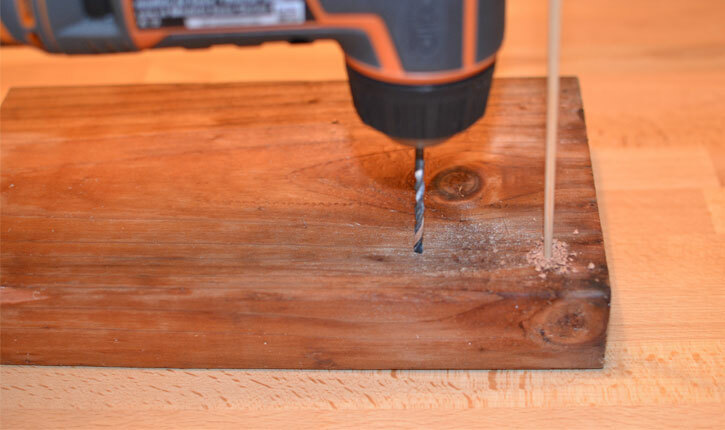 Use a drill tip with the same diameter as the bamboo skewers. 1- Combine the Agalita, Lactose and salt in a bowl until you get an homogeneous mix. 2- Mix the black powdered color with the water. 3- Gradually incorporate the stained water into the powder mixture, beating lightly to obtain a smooth paste. 4- Stand the batter in the refrigerator for 12 hours. Variation: to recreate granitic river stones with black specks, do not incorporate the black coloring at this point. Mix the coloring with 7.25g of olive oil, and after letting the Agalita paste rest for 12 hours, add the blackened oil mixture. 1- Boil the potatoes in their skins in 0.8% salted water (8g salt per 1000g water). The potatoes should be cooked through and keep a firm texture. 2- Drain the potatoes and lay them on a tray. Let them cool to an internal temperature of 45 °C (113 °F) before proceeding with the coating step. 1- Pierce the flattest part of each potato with a wooden skewer and dip them into the batter. 2- Stand the potatoes vertically on a perforated surface. 3- Dry them at 60ºC (140 ºF) for 30 minute in a convection oven or dehydrator if you can fit them in. If you can't set your oven temperature this low, set it at the lowest possible temperature and leave the door partially opened a few inches, maybe placing a folded kitchen towel in the door. Leave the potatoes longer if necessary until the coating is completely dry. 4- Remove the skewers and cover the hole with more partially dehydrated batter using a spatula. 5- Allow the batter covering the hole to dry in the oven or dehydrator for another 15 min. 1- Warm the coated potatoes in the oven at 70°C (160°F) for 5-7 minutes. Optional: Heat a few real polished river stones the size of the potatoes in the oven too. The stones will add the finishing touch to the presentation and keep the potatoes hot for longer. Serve the potatoes in between the stones. 2- Serve a heaped portion of alioli in smaller, individual dishes. 3- The potatoes should be eaten with the fingers and the first bite should be taken without the sauce. This will accentuate the difference in the texture between the coating and its content. After that, the potatoes should be dipped into the alioli.